Now Archived: 16 June 2016 Event with Anne Schoeffler You can access this event by visiting the PolarConnect Archives. 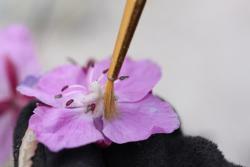 Researcher Christine Urbanowicz supplements a flower by painting pollen onto the stigma. Photo by Emily Dodson. The research focuses on the interactions between plants and their pollinators, which are animals that aid in plant reproduction through transporting pollen. The aim is to understand how changes in temperature and precipitation may influence plant-pollinator interactions and plant reproduction. Temperature and water availability may alter the timing of flowering and floral traits that attract pollinators, such as nectar volume and flower size. In addition, temperature may alter what pollinator species visit flowers and how often they visit. The combination of these effects on plants and pollinators may influence plant reproduction, measured as the number of fruits and seeds a plant produces. The researchers hope to relate changes in the abiotic environment to floral attractive traits, pollinator visitation, and ultimately the reproductive success of plants. Three focal plant species, blueberry, harebell, and dwarf fireweed are used because they are common in the area and flower at different times of the season. This work can have important pan-Arctic and global implications. The majority of flowering plants in nature and one third of our crop plants depend on pollinators to produce fruits and seeds. As temperatures rise in the Arctic, successful adaptation and range expansion of many plants, including plants migrating into the Arctic, will depend on pollinators. This study will help us determine which mechanisms may most strongly drive changes in plant-pollinator interactions and plant reproduction. A view of Kangerlussuaq, Greenland. Photo by Emily Dodson. 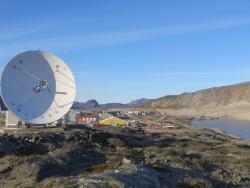 The research team will travel to Kangerlussuaq on the west coast of Greenland. The climate in Kangerlussuaq is arctic, with temperatures ranging from -25 to 18 degrees Celsius throughout the year and averaging between 5 and 18 degrees Celsius during the summer. The team camps and works outside of the town where most sites were reached on foot or by truck. The team occasionally spends a night at the local science station in order to charge instruments and take advantage of a hot shower. 29 June 2016 Why Do Arctic Science?! 28 June 2016 Boots on Ice! Seton Catholic School's middle school Garden Club applied for and received certification as a Schoolyard Habitat. The school qualified by having a water source (reclaimed pond), forage for animals, and a pollinator garden. Students use these spaces for curricular activities and have received grant funds to extend the gardens and build a nestbox trail for cavity-nesting birds. Hudson Life magazine describes Schoeffler and Urbanowicz's PolarTREC expedition to Greenland. It describes the research, the process of pollination, and the challenges of Arctic research. Working with a PolarTREC research team headed by Christine Urbanowicz, Dr. Schoeffler will study plants and pollinating insects in Greenland. The expedition will focus on consequences of climate change in the Arctic. The public can follow Schoeffler's journey and research via www.polartrec.com/expeditions. PolarConnect Event: Anne Schoeffler discusses "Climate Change and Pollinators in the Arctic"
Teacher Anne Schoeffler talks about field work and study sites as part of the PolarTREC expedition “Climate Change and Pollinators in the Arctic” based out of Kangerlussuaq, Greenland. A Hudson Hub article that relates the basic facts, that Anne Schoeffler has been selected for PolarTREC. Anne Farley Schoeffler has been teaching sixth, seventh, and eighth grade science near Cleveland, Ohio since 2003 and focuses on problem-solving and investigation skills. She holds a PhD in Linguistics from the University of Chicago and a much more recent Masters in Science Education from Montana State University. She has backpacked and canoed in the backcountry in Minnesota, Ontario, Montana, and Peru. She shares this passion for the outdoors with her students through outdoor education camp, outdoor classes, an on-campus ecosystem restoration project, and service learning (water quality testing and invasive species remediation). She is the facilitator for an extracurricular philanthropy education program and is also an 18-year Girl Scout volunteer. For fun she loves to hike, read, travel, and spend time with her family. Ms. Urbanowicz is a PhD student in the Ecology and Evolutionary Biology graduate program at Dartmouth College. Her research explores the effects of climate change on plant-pollinator interactions. Pollinators and plants might have different responses to climate change, which can have important environmental and agricultural consequences. She is currently focusing on the Arctic, where environmental change due to climate change is rapid. This research focus translates to many happy hours in the field, collecting data about flowers and their visitors. More information about Ms. Urbanowicz's research group can be found here. Thank you, Lee! Reading your questions and responses while I was in the field gave me a little taste of home! I believe it is actually a cinquefoil. On 6/22/16 11:27 AM, PolarTREC wrote: I have replaced the photo, and it now shows Dryas as it says.